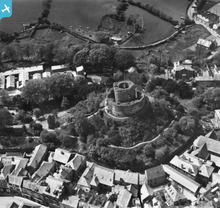 [EAW005835] The castle, Launceston, 1947. This image has been produced from a print. 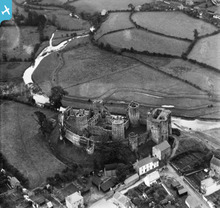 This castle was begun in the late 1000s, it is mentioned in the Domesday Book of 1086. It is a Norman motte and bailey castle. 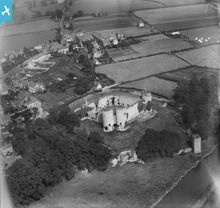 [EAW019682] Pickering Castle, Pickering, from the south, 1948. This image has been produced from a print. A timber motte and bailey castle was built on this site by William the Conqueror in 1069-70, after the 'harrying of the North'. It rebuilt in stone between 1180 and 1236. This is the site of a Norman motte and bailey castle. The original timber castle was replaced with a stone one in 1200s. 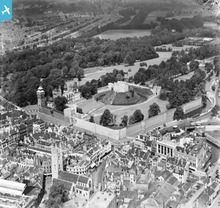 [WPW041264] View of Cardiff Castle with St John the Baptist church, oblique aerial view. 5"x4" black and white glass plate negative. This castle was built in the 1000s by the Normans, it is on the same site as an earlier Roman fort. 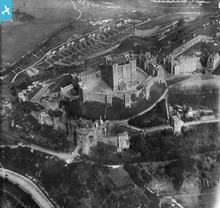 [WPW018856] View of Rhuddlan Castle, oblique aerial view. 5"x4" black and white glass plate negative. 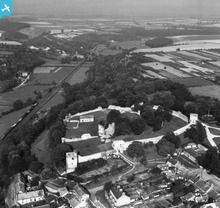 This castle was built in 1277 by Edward I, the site itself had been in use from much earlier and is mentioned in 1086. 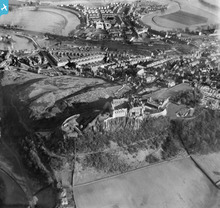 [SPW020258] Stirling, general view, showing Stirling Castle and Gowan Hill. An oblique aerial photograph taken facing east. 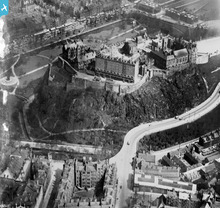 [SPW017703] Edinburgh Castle. An oblique aerial photograph taken facing north. 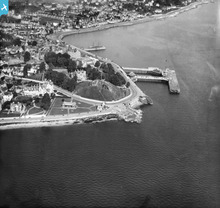 [SPW019581] Dunoon, general view, showing Dunoon Castle, and Pier Esplanade. An oblique aerial photograph taken facing north. The first stone castle was built here in the 1200s. It became a royal castle in 1377. When I was kid Beaumont Leys was where the massive swimming pool with water slides and a wave machine was - a real treat!